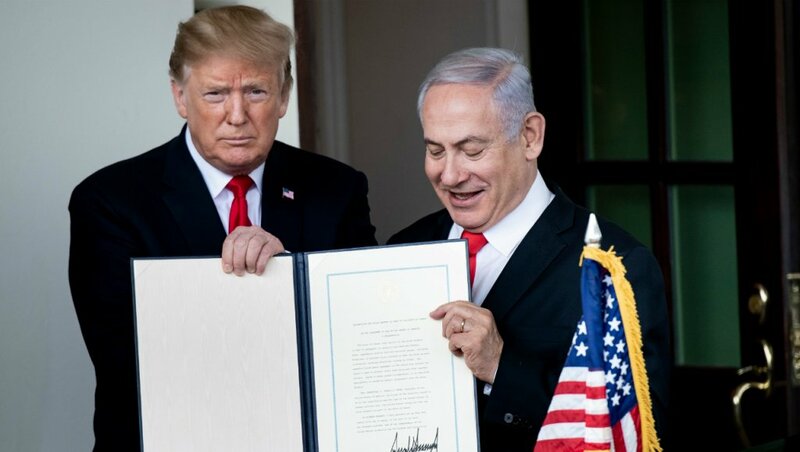 On Monday, during a visit to Washington of Israeli PM Binyamin Netanyahu, US President Donald Trump signed a declaration on behalf of the US Government, recognising Israeli sovereignty on the Golan Heights (the text of the recognition document is here.) This Update deals with the background to this decision and why it has been widely welcomed in Israel, while also subject to international criticism. We lead with an editorial from the Jerusalem Post, which says the recognition is overdue because the Golan Heights is vital to Israeli security, and therefore will not be given up. The paper also notes that this is the reason the recognition is supported by a consensus of almost the entire political spectrum in Israel. The paper concludes that Trump’s move recognises the obvious, but it still deserves to be regarded as courageous, because most of the international community has been in denial on this issue for decades. For the paper’s argument in full, CLICK HERE. Next up is American columnist Jeff Jacoby offering a more systematic case for Golan recognition. He offers a good history of the Golan over the past 70 years and notes that lessons of history seem clear – the Golan in Syrian hands promoted conflict, in Israel’s hands, stability. He also addresses the key claim against the move, that it involved Israel being allowed to keep territory gained through military force, something it is argued is against international law – saying this only makes sense if Israel had obtained the area in an aggressive war, not in self-defence, as was actually the case. For this good summary of the case for the move, CLICK HERE. Our final entry comes from Itamar Marcus, head of Palestinian Media Watch, who argues that the recent launch of missiles from Gaza into Israel by Hamas is best understood as an outcome of the battle for leadership of the Palestinians between Hamas and Fatah, which rules the West Bank via the Palestinian Authority. He says recent demonstrations in Gaza against Hamas rule, for which Hamas blames Fatah, have intensified the already burning enmity between the two factions, and uses quotes from both sides as evidence of his point. Marcus argues that launching missiles at Israel, even when it led to a tough Israeli response, has always elevated Hamas’ popularity on the Palestinian street, and so a quest to boost Hamas’ popularity is likely behind the missile launches. For all the details, CLICK HERE. Another piece from Palestinian Media Watch discussing the role of internal Palestinian politics in recent violence comes from Maurice Hirsch. Some other arguments for Golan recognition – from former Israeli official Yoram Ettinger, retired US Colonel L. Scott Lingamfelter, and columnists Jonathan Tobin and Evelyn Gordon. Plus, some more sceptical views about the value of the decision from former US diplomat Fred Hof and some other former US officials. Important discussions of international law and the Golan question from lawyer and former diplomat Vivian Bercovici, and blogger Elder of Of Ziyon. Plus, here is testimony from International Law expert Eugene Kontorovich, given last year. Articles on why the decision gained only a minimal reaction across most of the Arab world in the New York Times, and Seth Frantzman of the Jerusalem Post. While the current rocket violence from Gaza appears to have ended, Israel is preparing for major clashes along the Gaza border organised by Hamas over this weekend. Isi Leibler’s latest take on the Israeli election campaign. Tzvi Fleischer on how the Australian media’s failure to report adequately on the anti-Hamas protests in Gaza left Australians unable to grasp the likely causes of the latest rocket fire from there. Naomi Levin on some new light shed in Canada on Australia’s role in disrupting Hezbollah’s criminal activity. AIJAC’s statement commending the Australian government for its repudiation of flagrant anti-Israel bias at the UN Human Rights Council. This recognition, which really should have come nearly 40 years ago, is supported by a consensus of nearly the entire political spectrum in Israel. ‘After 52 years, it is time for the United States to fully recognize Israel’s Sovereignty over the Golan Heights, which is of critical strategic and security importance to the State of Israel and Regional Stability,” President Donald Trump tweeted Thursday evening, just days before Prime Minister Benjamin Netanyahu’s visit to the White House. Last week, Netanyahu went to the Golan with US Senator Lindsey Graham – who, despite an acrimonious Republican primary, has since become a Trump ally and trusted adviser on international relations – and US Ambassador to Israel David Friedman, a key player in American policy towards Israel. Graham said that he and Senator Ted Cruz would work towards US recognition of Israel’s sovereignty over the Golan Heights. Now, Trump has been brought on board to the idea – and it is about time. Hopefully, his tweet will be turned into actual American policy. After the international community spent over five decades being in denial, Trump is changing the equation and recognizing what has long been clear to all: Israel is not giving up the Golan Heights, which is vital to our security. There have been some murmurs that this is not the right time to recognize Israel’s sovereignty over the Golan Heights, because it is so close to our upcoming election. While this is a valid concern, and Netanyahu is likely to get a boost from the decision, it is far overshadowed by how overdue and undeniable such a move is. In recent years, international recognition of Israel’s sovereignty over the Golan Heights has gained traction politically, with politicians on the Right and Center talking about it in meetings with foreign dignitaries, as well as in addresses in the Knesset and other public forums. “The nation is with the Golan,” in the words of the popular 1990s bumper sticker opposing conceding the region in peace talks with Syria. Israel officially annexed the Golan Heights on December 14, 1981, after almost a million Israelis signed a petition demanding it. The law is known to have set a record, passing all three Knesset votes in one day. The UN Security Council, however, declared that it was not valid under international law, and the law sparked a crisis between Israel and the US under president Ronald Reagan. In the subsequent decades, several prime ministers, including Netanyahu, have taken part in negotiations to give up the Golan Heights in exchange for peace with Syria. However, we now know, after years of civil war in Syria, what a massive mistake that would have been. If we had given up the Golan Heights, we would have Iran, our greatest and most powerful enemy, on the banks of the Sea of Galilee, threatening us from the high ground overlooking much of Israel’s North. The Golan Heights are absolutely necessary for Israel’s long-term national security, and recognizing it is the right thing for all of Israel’s allies, not just the US, to do. Together with recognizing Jerusalem as Israel’s capital, Trump has stated the obvious. That doesn’t sound like much, but when it comes to the way the world treats Israel, denial has long been the modus operandi – and bucking the diplomatic paradigm is a brave move. Israel is not going to give up on the Golan or our historical, unified capital of Jerusalem. Thank you, President Trump, for having the courage to say so – loud and clear. During a White House meeting with Benjamin Netanyahu on Monday, President Trump signed a formal proclamation that the United States recognizes Israeli sovereignty over the Golan Heights. 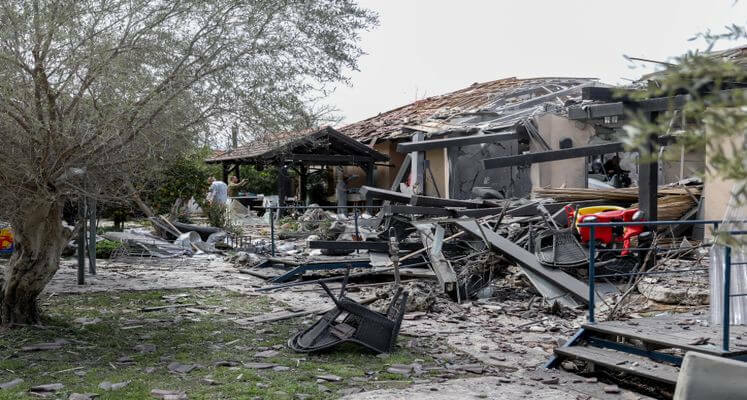 In so doing, the president acknowledged a longstanding fact of life, bolstered a vital American ally, promoted stability in a deeply unstable neighborhood, and upheld the oft-ignored but crucial distinction between acquiring territory through aggression and acquiring it through lawful self-defense. Good outcomes all, extending the Trump administration’s already exemplary record when it comes to the Middle East. Trump’s announcement is being described as a pro-Netanyahu campaign ploy, but no matter who wins Israel’s upcoming election, the Golan will remain part of Israel. Which is why even Netanyahu’s political foes applauded the American announcement. Benny Gantz, the retired general hoping to become Israel’s next prime minister, publicly thanked Trump for his proclamation. The president’s signature changes nothing on the ground. Israel has held the western two-thirds of the Golan Heights — a plateau that towers over the Sea of Galilee and much of northern Israel — since the 1967 Six Day War. That war, recall, was one of blatant aggression against Israel: Syria joined Egypt and Jordan in an assault that Syria’s Defense Minister Hafez Assad had labeled “a battle of annihilation” to “explode the Zionist presence” in the Mideast. But Israel declined to be annihilated or exploded. It repelled its invaders and seized the Golan Heights, from which Syria had been shelling Jewish farms and towns for more than 20 years. In the aftermath of the war, Israel offered to return the territory in exchange for peace. Damascus refused to negotiate. It tried to recapture the Golan Heights in a massive armored invasion in 1973. Israel repelled that threat too. Nonetheless, Israeli and US leaders well into the 1990s kept trying to entice Damascus to make peace with its Jewish neighbor in exchange for a return of the Golan. In his first term as prime minister, Netanyahu used a secret back channel to communicate with Syrian President Bashar Assad about a land-for-peace deal. Fortunately, nothing came of those efforts. Syria’s implosion in 2011 plunged the country into a hellish civil war that eventually included Iran, Russia, the Islamic State, and Hezbollah. If Israel hadn’t retained the Golan Heights, the plateau would likely have been captured by Iran or ISIS, and Israel might well have faced an unspeakable existential nightmare. Instead, the Golan Heights remained an oasis of stability and decency amid the savagery of the Syrian war. Israel even made use of the territory to provide free medical care to thousands of Syrian civilians. If Israel had seized the Golan Heights as an act of aggression, it would arguably have no right to keep the land even after all these years. But in 1967, Israel was the target. It seized the Golan in a defensive war against an enemy explicitly bent on “annihilation.” Syria forfeited its sovereign right to the territory when it was defeated by its intended victim. To claim otherwise is to claim that a belligerent aggressor should lose nothing for waging an unlawful war. That would be folly. By endorsing Israeli sovereignty over the Golan, the Trump administration is sending a message of deterrence to would-be warmongers. It’s a message that should have been sent years ago. Better late than never. Since the end of the Palestinian civil war in 2007 when Hamas took control of the Gaza Strip, Fatah and Hamas have been sparing in an ongoing internal war for the hearts and minds of Palestinians. What explains the decision to launch a rocket attack into central Israel, with devastated a home at Mishmerat and injured seven Israelis, on Monday? Numerous analysts are trying to explain the timing of Hamas’ missile launch this week at a town north of Tel Aviv, 85 km. inside Israel. Looking at what is challenging Hamas in recent weeks, the missile attack in all likelihood has little to do with Israel. While Hamas’ missile was directed at Israelis, Hamas’ real target was Fatah, the ruling PA political party of Mahmoud Abbas. Since the end of the Palestinian civil war in 2007, when Hamas took control of the Gaza Strip, Fatah and Hamas have been sparring in an ongoing internal war for the hearts and minds of Palestinians. There are periods when PA-Fatah generate more hate incitement against Hamas, and vice versa, than against Israel. Now is one of those times. In recent weeks, the enmity and mutual incitement between Fatah and Hamas has been growing. Demonstrators have taking to the streets of the Gaza Strip to protest Hamas’ failed administration. Hamas has responded by blaming the demonstrations on Fatah and arresting Fatah activists. Two weeks ago, when Hamas fired missiles toward Tel Aviv, Fatah spokesman Osama Al-Qawasmi attributed those launches as an attempt to distract Gazans from their misery of failed Hamas rule: “Launching missiles in order to put down the uprising of the starving is an unacceptable act, and is overt and obvious to all” (Official PA daily Al-Hayat Al-Jadida, March 16, 2019). The attacks on Hamas by PA-Fatah were intensified on official PA TV and on Fatah’s Facebook page, both of which presented pictures of injured Palestinian children who they claimed were beaten by Hamas. Hamas has not stood silently in the face of these verbal attacks by Fatah. Hamas tried to delegitimize Fatah in the eyes of the Palestinian population by releasing fabricated statements of condemnation of last week’s terrorist attack in which an Israeli father of 12 and a soldier were murdered and attributing them to PA leaders. Hamas likewise claimed that PA Police Commissioner Maj.-Gen. Hazem Atallah had said: “We are fearlessly and unashamedly making efforts to find the one who carried out the spiteful operation in Salfit” (Website of Hamas’s Al-Aqsa Channel, March 20, 2019). This of course was likewise denied, but the pattern is clear. Given the fact that terrorism, including murder of civilians, is supported by nearly the entire Palestinian population, by announcing that the PA police are condemning the attack and searching for the terrorist on behalf of the Israeli army, Hamas was clearly trying to blacken the PA’s standing. It is in the context of this 12-year internal Palestinian conflict between Fatah and Hamas that Hamas launched the rocket attack on Israel this week. Demonstrations against Hamas have been continuing throughout the Gaza Strip. There have been numerous cases of brutality by Hamas police that are being witnessed and reported on by Gaza’s residents themselves, and there have been injuries. Given its desperate internal situation, and with its popularity dropping daily, Hamas decided to launch a rocket at central Israel. This act may be intended to bring a strong military response from Israel. Hamas has used this tactic in the past to gain popularity. Even though Hamas’ wars against the Israeli army have brought destruction upon the Palestinian population, and are responsible for thousands of deaths, Palestinian opinion polls show that Hamas always had elevated popular support because they fought against Israel. The polls after each of the three Hamas-Israeli conflicts showed Hamas more popular than Fatah. Accordingly, Hamas’ firing of the missiles creates for it a win-win situation. If Israel does not respond with a strong reprisal, it can show Palestinians that it attacks Israel’s population centers with impunity, and that Israel has lost its deterrence. They will present Israel as weak in the face of the terrorist group. If Israel does come back with a strong military response, Hamas is seen as being heroic for having taken on the Israeli army. Tragically, Hamas and Fatah are fighting each other with the only weapon they have that assures popularity among the broad spectrum of Palestinians: attempting to kill Israelis. The writer is director of Palestinian Media Watch (palwatch.org).